I built my first multimedia PC during the summer of 2001. This was a 1.2GHz AMD inside a wooden case. It was big and at first unbearably noisy. At the end I had spent quite a bit of money making it quieter. It was still bulky and aesthetically not optimal. The heat problem was bad, especially under heavy load. Somewhere during the winter, I heard about EPIA motherboards. It immediately sounded like something I should have used from the beginning. Then, in the summer of 2002, I could contain myself no longer. I ordered an EPIA motherboard and started designing a case that even my wife would accept into our living room. 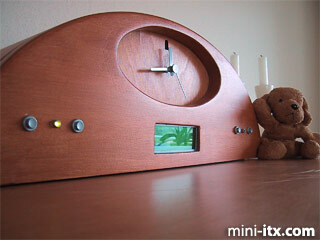 From the start, I wanted to make something that does not look like a PC or a DVD player. It took me months to build it because I have so little free time, but I enjoyed every phase of the project. I used components from the previous media PC. I only bought an EPIA 800, a larger 80GB hard disk and the Windows XP operating system. I needed to replace the fan in the power supply. I put in a supposedly more quiet 6 cm fan, but that turned out to be too noisy too. After I reduced the voltage to 5V, the PSU was quiet enough. Even the Papst 12dB fan at the back of the clock is wired to run with 5 volts. 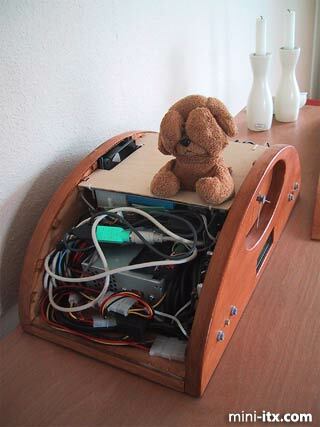 Both my assistant (in the picture) and I think that there are too many and too long wires inside. In the picture above you see the power supply lurking behind the wires. The wires are extension cords from the PS/2 mouse and keyboard connectors to the Logitech wireless receiver. I removed the receiver casing because it would have taken too much room. Why extension cords? Because without them, I could not have closed the lid on the clock. The PS/2 to USB connector thingamajigs protrude too far from the motherboard. The Logitech receiver is hot glued to the inside of the front panel. My assistant is sitting on a piece of plywood. On the other side of this is the EPIA 800 board upside down. Below my assistant and the blue IDE cable connector, you can see a glimpse of the IrMan IR Receiver electronics. Again, I needed to remove the bulky casing. I also added wires between the actual IR sensor and the rest of the components. The black mark at 12 O'Clock on the clock face is the IR receiver. And no, the clock arms do not prevent it from working at any time. The small battery you see is not for the computer but for the actual clock with the silver hands. The clock mechanism did not fit with the casing in there. The reason is the Hauppauge TV card that is right behing the face. On the other side of the case, you can see the DVD drive and more wires. 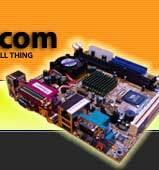 In these pictures, you see more of the wonderful EPIA motherboard. On the left you see the other end of the Hauppauge TV PVR PCI card. The wires going into it are the TV antenna, S-Video from the VCR, audio in from the VCR and audio out to the EPIA.